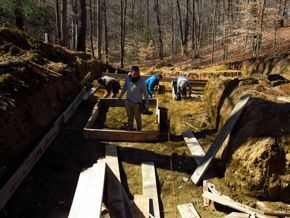 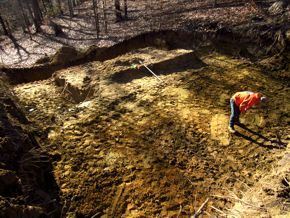 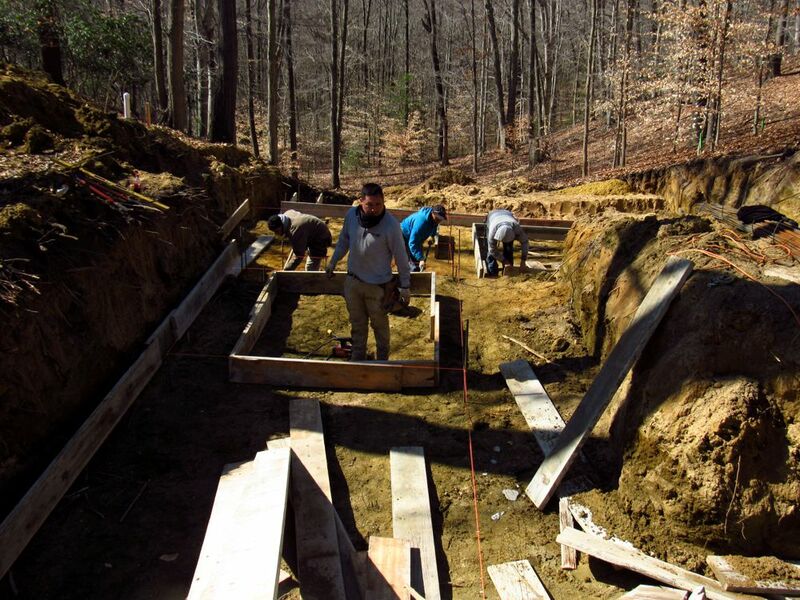 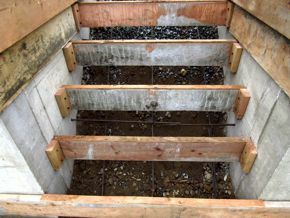 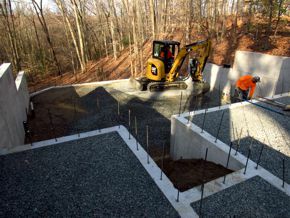 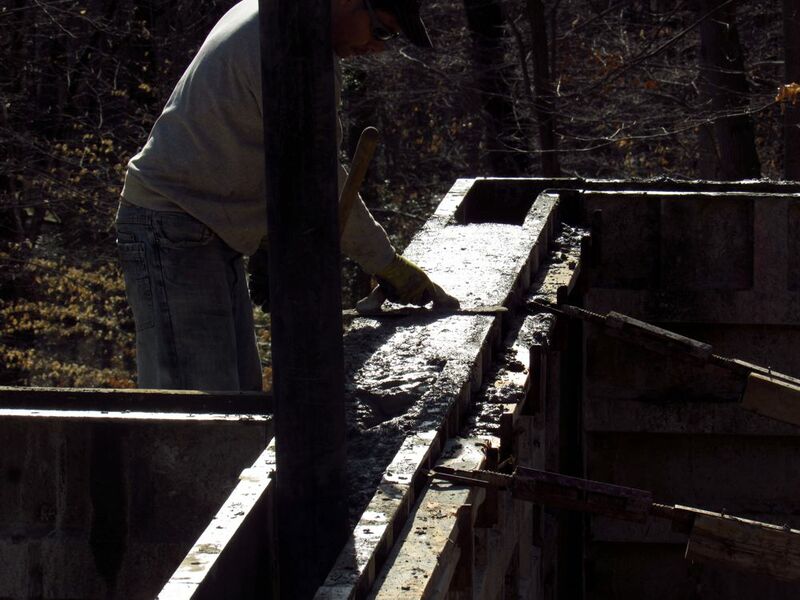 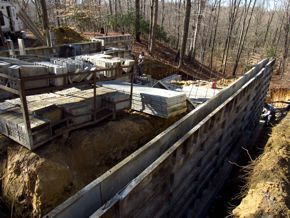 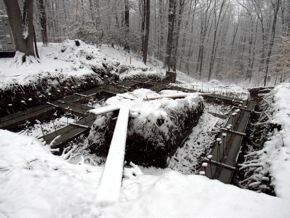 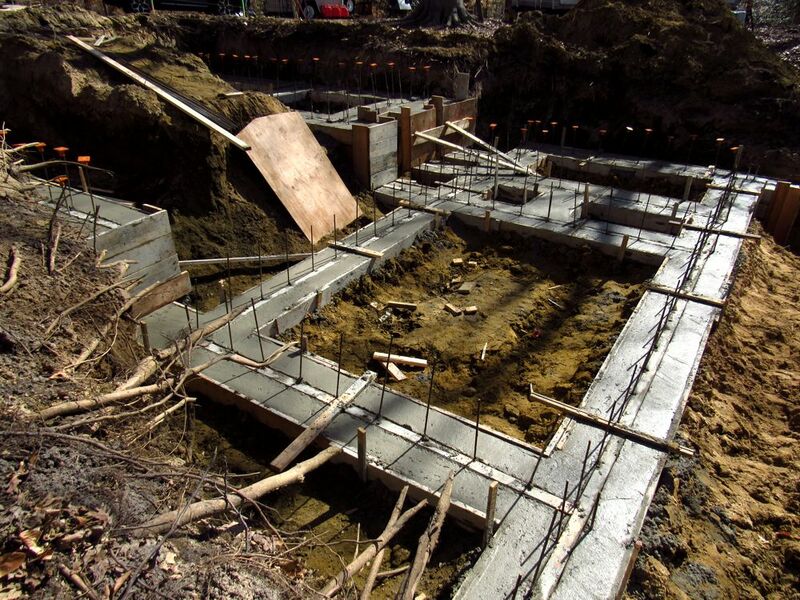 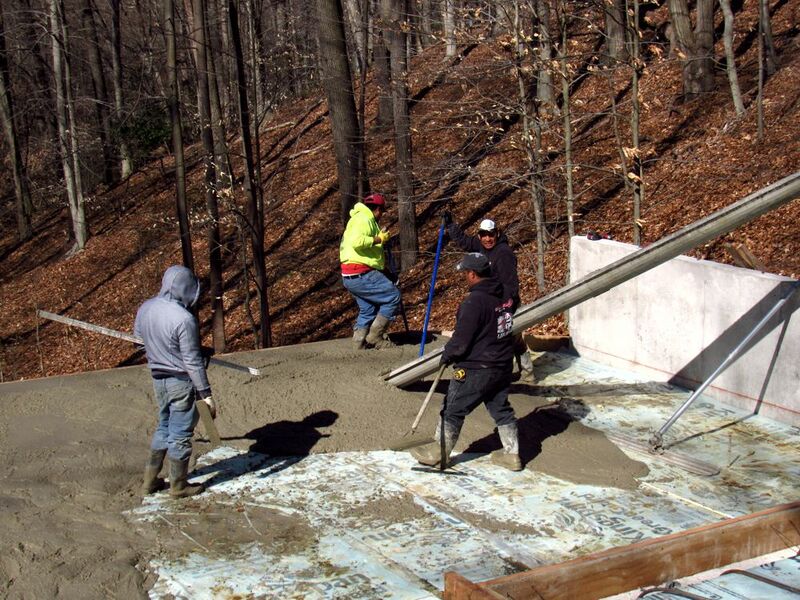 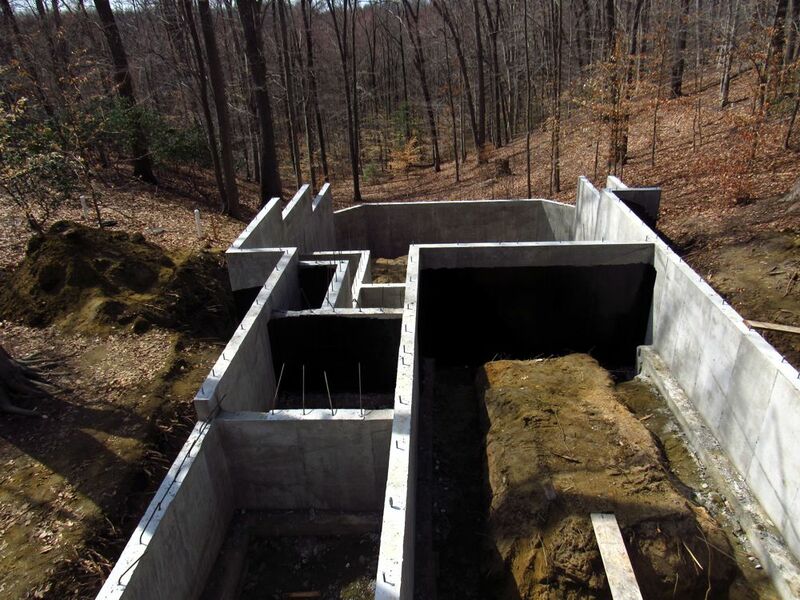 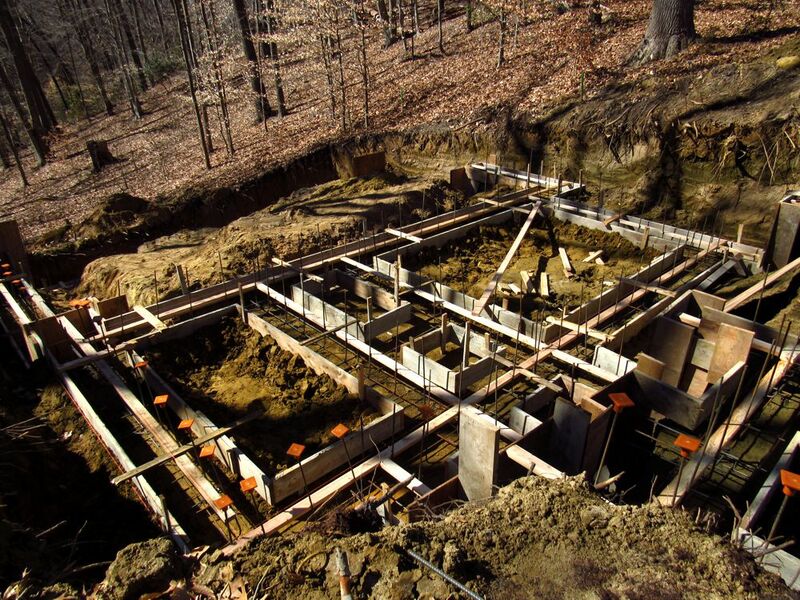 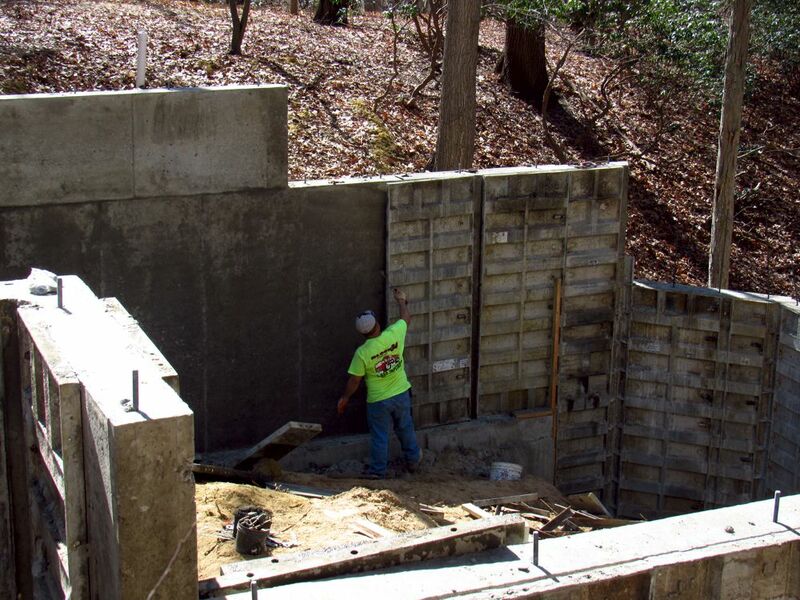 The next day, a crew of masons descended on the property to assemble the footing forms (above). 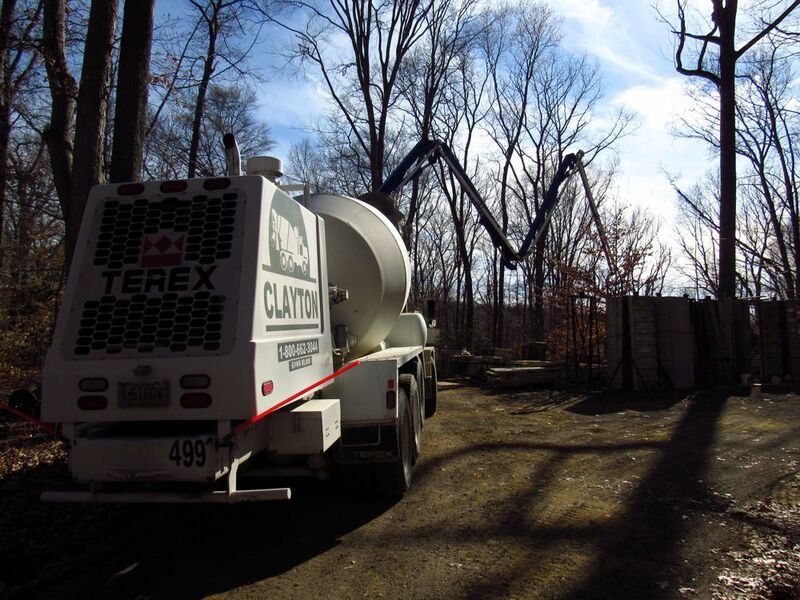 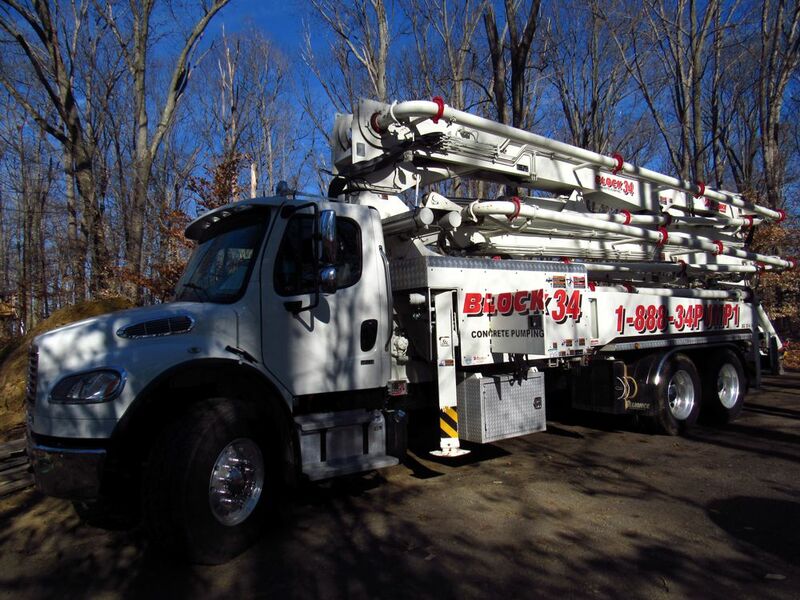 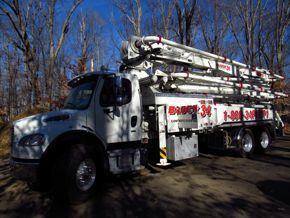 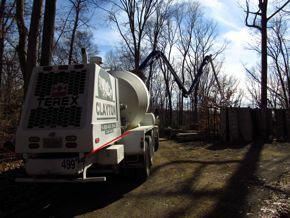 Then, on the third of March, an enormous concrete pumper arrived to pour the footings (below). 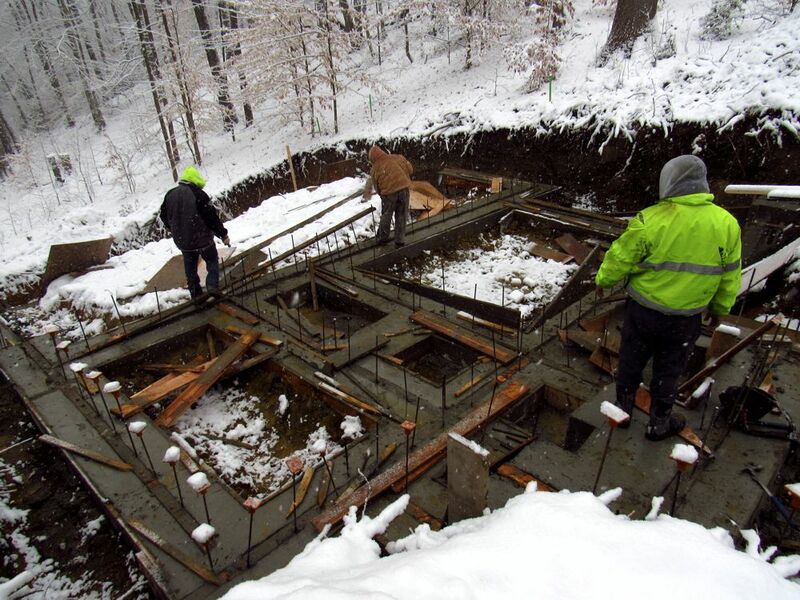 That night there was a light snow, but it didn't keep the crew from stripping the footings the next morning. 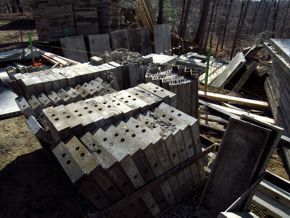 The following week, a crane arrived once or twice each day to drop off huge stacks of aluminum panels, and work began on the foundation forms (below). 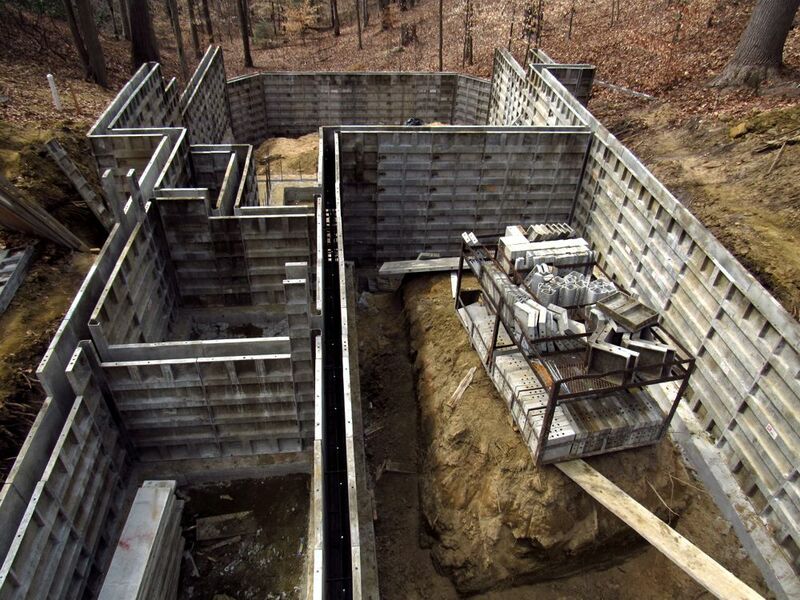 This was a lengthy, complex process made more so by the rough terrain, requiring a week and a half to complete. 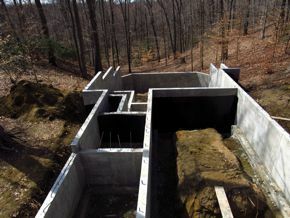 When it was done, it looked alarmingly massive to me; I had a hard time visualizing my home on it. 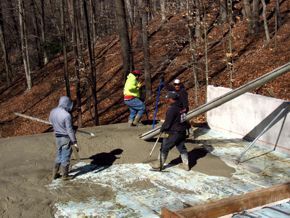 Concrete was poured on 11 March (below), which involved the concrete pumper and a long line of cement mixers—nearly a dozen of them. 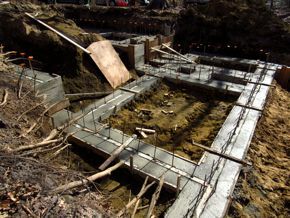 The next day they began stripping the forms, taking only a day to undo what took a week and a half to do. 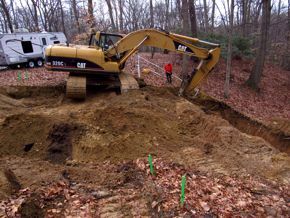 And there was yet much more to be done. 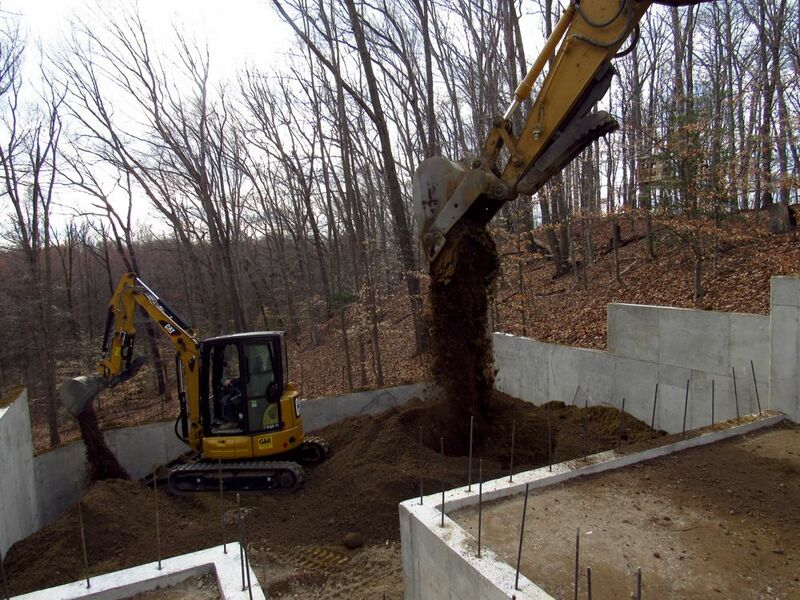 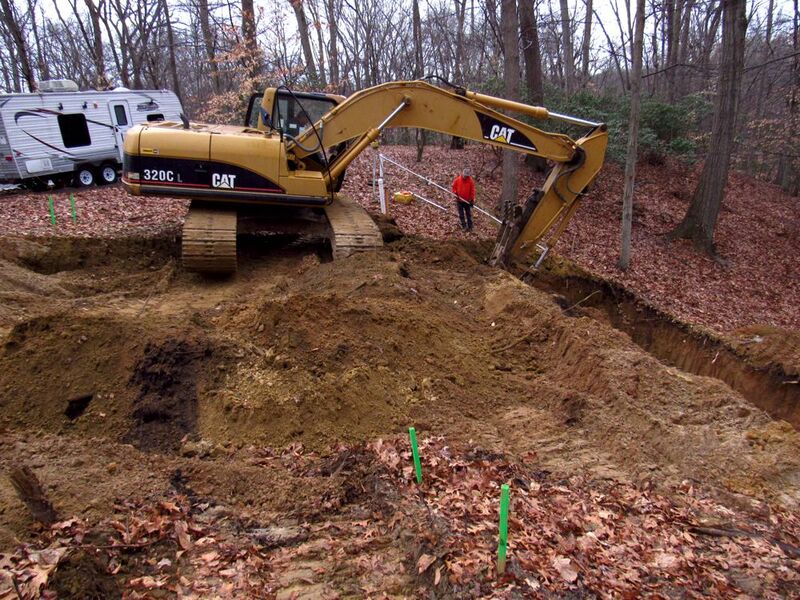 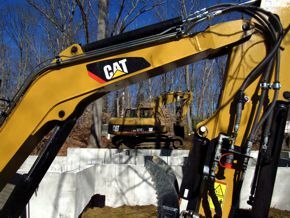 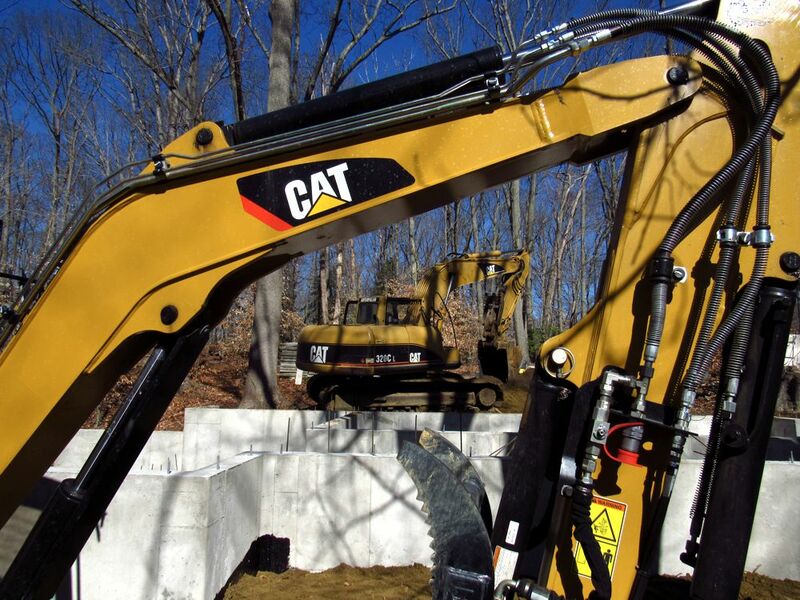 After all of the forms were packed up and shipped out, the excavators returned to back fill the foundation (below). 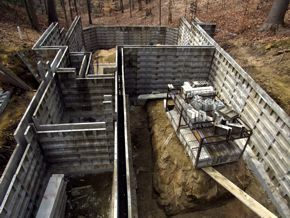 Again, because of the unusual design, it was a tricky process: they had to hoist a mini-excavator down into the lower levels to distribute the fill, and they spent three days doing the work. A little side-story: the plumber who spent two days assembling the waste lines never charged me for his work. 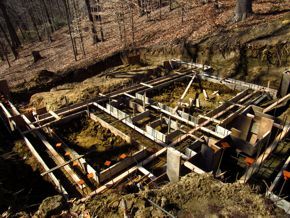 He was so enamored of the property, he did it just for the joy of being there; he visited several times, and even brought his wife once. 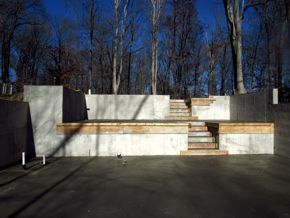 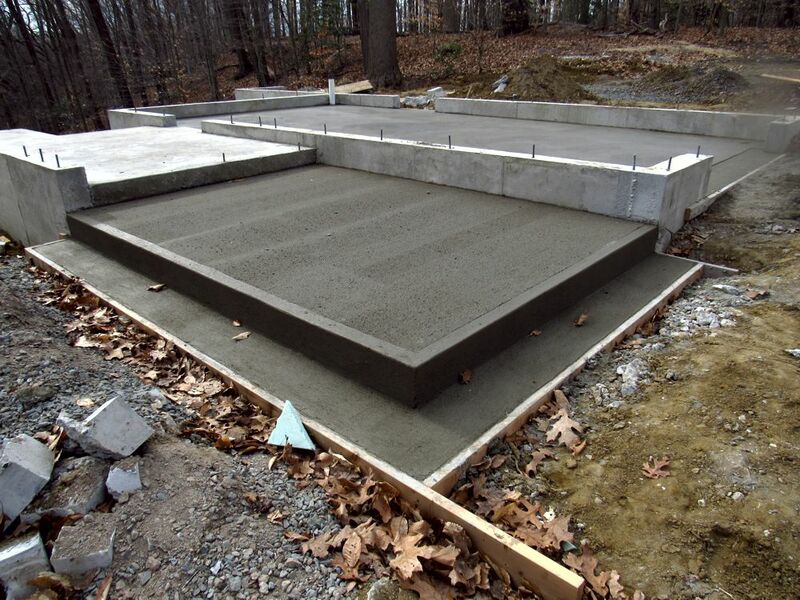 Anyway, the concrete crew then added forms for the slabs and steps (above), after which the they poured the slabs (below). 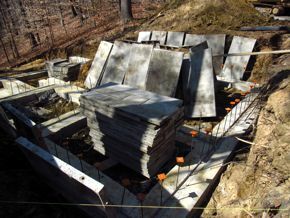 This was back-breaking work mostly done by hand, and it took a day to finish three of the five slabs. 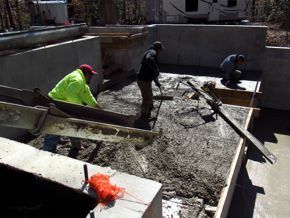 They returned on the second of April to pour the garage and front porch slabs (above), and again on the tenth to pour the deck footings. 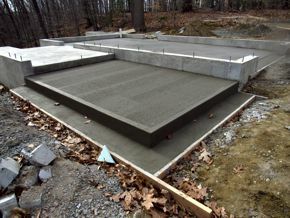 And with that, the foundation was well and truly finished.